A St. Clair County, Illinois man is suing the builder of his modular home claiming it failed to provide what was promised. Larry King filed the lawsuit Aug. 17 in St. Clair County Circuit Court against Contempri Industries Inc., doing business as Contempri Homes. King says he hired Contempri Homes to build a modular home in St. Clair County with the company's promise that it would be a custom, well-built home constructed by well-trained craftsmen. However, King claims the building was not well-built and unlike anything Contempri Homes agreed to provide. King accuses the company of poor construction and consumer fraud. He asks for more than $100,000 in damages and court costs. coach why did you post this story? Why is it relevant> How does one know if the customer is looking for free money or there are real quality issues. I was shocked that this was posted. Why are you shocked? In fact, I'm surprised more lawsuits aren't publicized. Modular is great if done right - a disaster if done poorly. Mostly for the homeowner - who can't get justice without a lot of cash. There should be more stories about when things go wrong to keep the industry honest and to warn buyers about what can go wrong. Right now all the press and postings about modular are positive hype. Balance the dialog with the full story. Kudos for posting this. Why shouldn't you tell the story when things go wrong? How else can the industry learn and grow? What are the facts? How do you know? Was the problem with the plant or the builder? Just curious. I have known the guys that run Contempri for many, many years. I know they have built tons of houses out of that production facility ans without a problem of any significance. Here you have an isolated circumstance that shows up. I know those guys well enough to know that if there was problem with the house of their creation, it would be fixed without question. So I would love to know the ENTIRE story, to fairly judge. I do agree that the story needs to be told, but I also know that the stick built industry has its fair share of stories that need to be told as well. The modular industry should not be singled out in the news. I don't think the article is bad for our industry. If Contempri did build a bad home and the home buyer wins his case shouldn't other buyers know about it before they decide who will build their home? If Contempri wins the case, i will be writing an article about that too....if someone takes a minute to let me know. Court case results rarely make the news. I sort of wish there was more coverage of litigation in the press, so that it could be viewed more fairly. In general, the industry takes the view that simply keeping everything tied down is the best procedure. The reality, is that conflict exists and attempting to hide it just makes it seem more sensational once it slips out. We are a modular builder with generally very positive client relations. One negative client with an aboslutely disgusting back-alley attorney, however, did once decide that he could extort us by threating all sorts of questionable legal action. We ultimately pervailed, but the threat of the lawsuit was only really powerful because the industry is so hushed about disputes. Our client (rightfully) recognized that one or two properly publicized articles could hugely damage our company and used this as leverage. The more disputes are discussed, however, the less this tactic can be used. Is the problem with the "plant or the builder" someone asks. Maybe it's both. Is there a clear line of responsibility between the two? And if something goes wrong and both builder and plant contributed but no one takes responsibility or action, the ultimate loser is the homeowner. Maybe modular isn't a good model for a homeowner. Maybe it's only good for spec builds. More honesty and publicity when things go wrong can bring positive change to any business. There is more to this story. 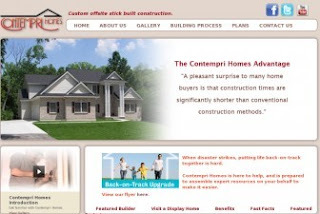 The home owner contracted with P & P Builders (which is owned by the executives of Contempri Homes) to by the home. All parties have a hand in this home and its issues.